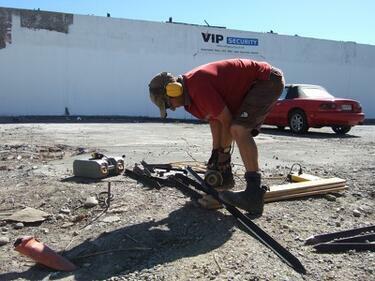 A man cutting up lengths of rebar from demolished buildings for Gap Filler's Playtime project. 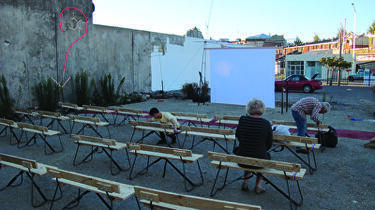 A photograph of volunteers setting up seating in Gap Filler's temporary outdoor cinema on the corner of Madras and St Asaph Streets. 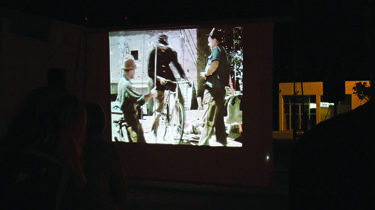 A photograph of a movie being shown in Gap Filler's temporary outdoor cinema. The cinema is on the corner of Madras and St Asaph Streets. 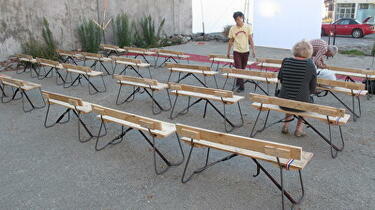 A photograph of seating for Gap Filler's temporary outdoor cinema. 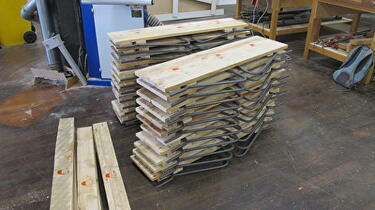 The seating is stacked in a workshop. 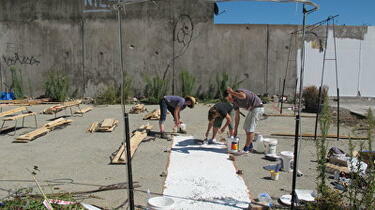 A photograph of volunteers painting a pathway in Gap Filler's temporary outdoor cinema on the corner of Madras and St Asaph Streets. 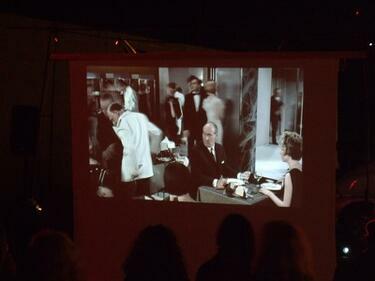 Jacques Tati's movie 'Play Time' playing at Gap Filler's temporary cinema, 'The Night Club'. Gap Filler's temporary cinema, 'The Night Club' during the day. 'Danger Keep Out' tape has been placed around the structure. 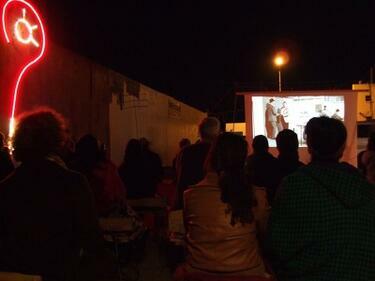 Members of the public watch Jacques Tati's movie 'Play Time' at Gap Filler's temporary cinema, 'The Night Club'. 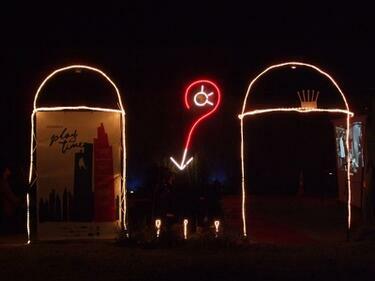 The entrance to Gap Filler's temporary cinema 'The Night Club', with doors created by lights, a light sculpture and a screen where 'Play Time' is being projected. The cleared building site on St Asaph Street where Gap Filler's Playtime project will be constructed, a temporary cinema called 'The Night Club'. 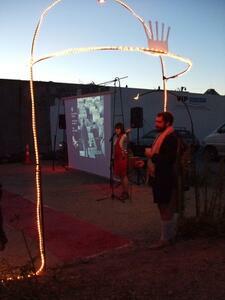 Coralie Winn, director of Gap Filler, introduces 'The Night Club' temporary cinema to members of the public. 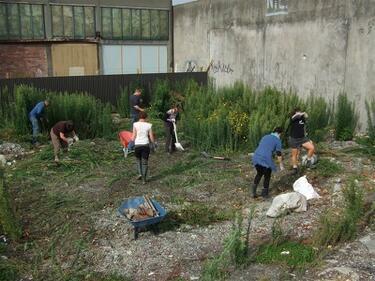 Volunteers help Gap Filler clear a vacant building site of weeds. 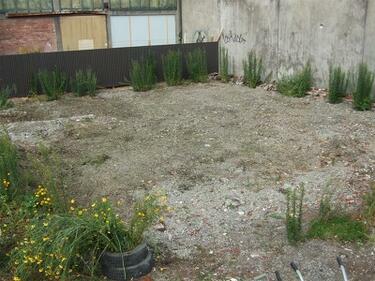 This is where Gap Filler's Playtime project will be constructed, a temporary cinema called 'The Night Club'. 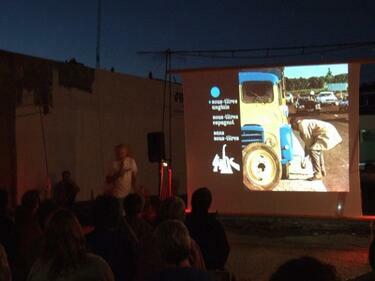 Members of the community wait for the film to begin in Gap Filler's temporary cinema, 'The Night Club'. 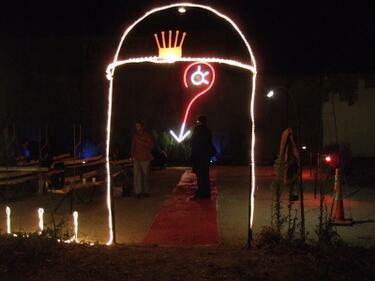 The entrance way to Gap Filler's temporary cinema, 'The Night Club', with a door made out of wire and lights, a red carpet painted on the ground, and a light sculpture on the wall of a building indicating the way in. 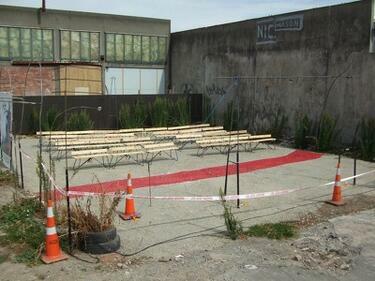 The aisle of 'The Night Club', Gap Filler's temporary cinema, painted onto the gravel of the vacant space. 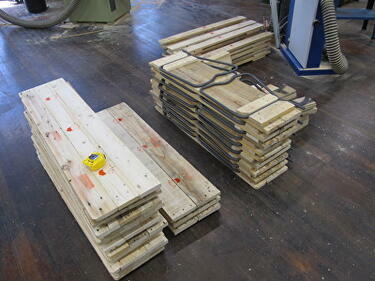 Currently it is white, but it will be painted red before opening time. 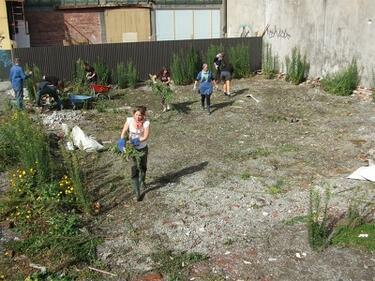 Volunteers working on a vacant site on St Asaph Street. 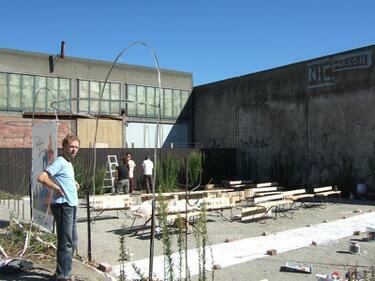 An outdoor cinema and temporary architecture project is being built here. 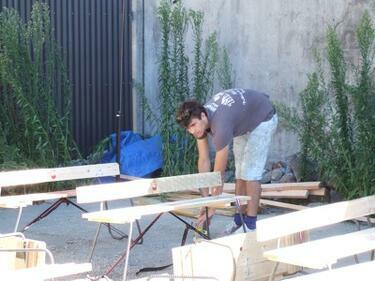 A volunteer constructs benches out of recycled material from demolished building. 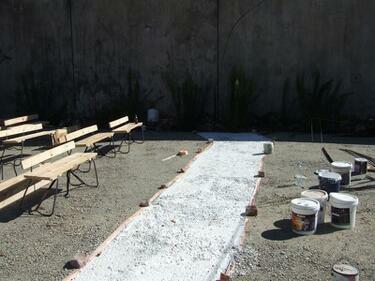 These benches will serve as seats for Gap Filler's temporary cinema, 'The Night Club'.